For a while now i have been meaning to review this film ,for two reasons or more .For one it was that it almost cost Jackie his life ,when a simple stunt (by Jackie terms) went wrong and resulted in him cracking open his skull .Two, it is one of the most successful films Jackie has made (especially in Europe) and spawned a equally successful sequel and a third is now in the works as i write. In this film Jackie plays Jackie aka Asian Hawk a adventurist who seeks out long lost articles and treasures for wealthy gain.From the beginning of the film we are witness to the Asian Hawk infiltrating a remote tribal camp to claim a long lost sword ,with a display of classic Jackie Kung Fu he confronts the tribe ,captures the sword and escapes by sledging down a steep hill face and jumping in to a large Bubble ball to escape and take of in his light aircraft. 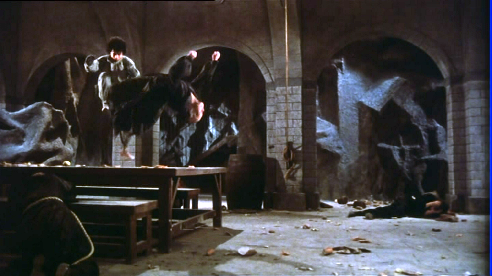 From the outset you are treated and stunned by what you see in the stunts and martial talent of Jackie as he leaps and bounces around ,there is more action in the first ten minutes then a Indiana Jones movie and top of that it's done for real. Next Jackie is seen selling the sword in auction and cheating to get the price up by having a stool pigeon bidding for him. But is when Jackie arrives back at his hotel that the film gets under way,as there are messages from a past friend who Jackie used to be in a band with ( Alan and Laura). Now during one of Laura's shows she is kidnapped and have sent Alan her boyfriend a ransom demand ,but not for money ,but for the Armour of God (See Above).Knowing that Jackie had the sword which he just sold the kidnappers have used his friends against him to get what they want. Now the kidnappers are a cult who believe with the Armour they can have ultimate power ,the Armour consists of five pieces , they have asked Alan for three pieces of the Armour ,so they must have already have the other two .Their plan is to ask a wealthy man Mr,Bannon ( a collector of antiques) to borrow the pieces he has,when they arrive he has no interest in their money and Alan decides he will borrow them himself .Now the house is heavily guarded and Alan is caught ,on top of that Mr, Bannons daughter is the girl who bought the sword in auction from cheating Jackie. The main fault here is the five pieces of the Armour ,in fact the real Armour consisted of six pieces from what is known ,read below. A minor flaw but ,it would have been nice for them to get it right. So what can Jackie and Alan offer Mr, Bannon,How about a full set of the armour if he lends Jackie his three.He agrees and his daughter May demands to go along to keep on eye on proceedings . First they must travel to where the cult are stationed .Luckily Mr,Bannon has a house they can stay in nearby.The cult base is in the mountains and they must meet there contacts in a nearby town which i believe is in Croatia Zagreb (Dolac Central Market, Upper town, Trnje.Being filmed in the then Former Yugoslavia the film was filmed in Croatia and Slovenia.The main shots of the cult base were in Slovenia ,Predjamski grad near Postojna.It looks familiar because i have been there. So as not to lose the Armour our three heroes employ a plan to offer them the Armour ,but when it's discovered to be a dustbin lid and broom the kidnappers are none to pleased.This results in a chase sequence filmed in the streets that defys belief as cars roll and crash in spectacular incidents that you will be sure people have died here .One scene has a 4x4 rolling down a flight of stairs in a market with people running for there lives and it all looks so close it's breathtaking. 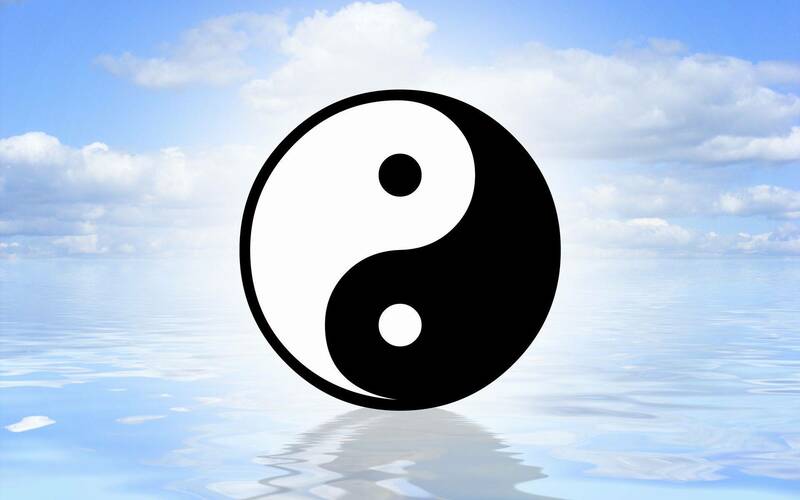 So now they must get in to the base of the cult ,so they hijack a couple of the cults people and disguise themselves so they may enter their lair. Thing is the cult leaders are not so stupid and realize that the Asian Hawk has entered the base ,which is high up in the mountains .Whilst May occupies a official there the boys try and find Laura to set her free.Now the cult have planned ahead and have drugged Laura so she is under their control .The three achieve their goal and free Laura and get her back to their house . 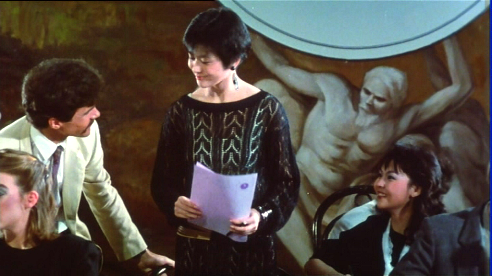 The film goes through a lot of innuendo once back at the house with Laura acting funny around Jackie and May falling out with Jackie because of a passionate moment ruined by Jackie's crudeness.Laura is curious so thinks Jackie as she wants to see the Armour ,but Alan is not so sure. 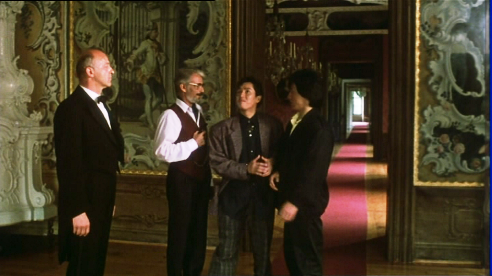 In a scene from a slapstick movie the four occupants runaround the house either trying to avoid each other ,get a peak at the Armour and in Jackie's case try and make amends with May ,but when Laura ends up in Jackie's room May see's and is dismayed. meanwhile Alan is tracking Jackie and when he goes to Jackie's room Laura drugs him ,thinking he is Jackie . The following morning Jackie discovers May and Alan plus the Armour has gone.Now it's up to Jackie to get the Armour and free his friends from the cult. With no concern for his safety he heads to the base high up in the mountains ,breaking in and sneaking in to trace Alan and Laura 's whereabouts.With spates of Monkey style jumping Jackie shows a agility you have to marvel at as he hides and runs around.Once locating the twosome he he agrees to free Laura and she remembers his nick name ''cowboy'' it's then he knows that the drugs have worn off .In a play of against Alan he plans to leave Alan behind to fend for himself and get Laura out ,but with a smoochy speech for Laura she says she's not going with out him.With that Jackie says OK but it's gonna cost you ( playing the hard man) . 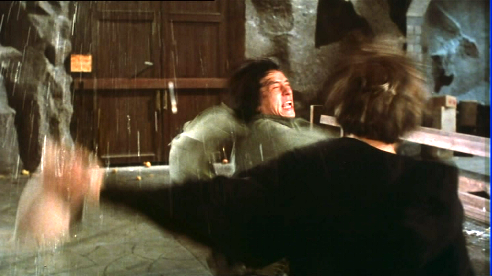 When Alan gets accidentally pushed down a food store chute Jackie ends up going to save him once again ,it's this scene that highlights Jackie's ability to combine comedy and Kung Fu in to a piece of entertainment that will have you reaching for the rewind button to view the action you missed because you were laughing. 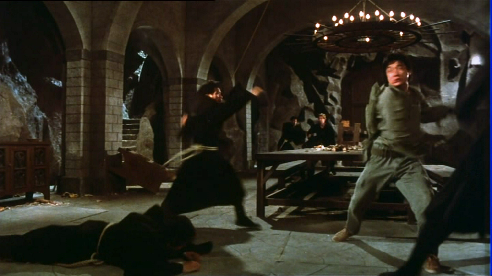 A brilliant scene with a log ( or should i say a tree) on fire to ward of attack from cult members and a fight with plates and food that gets out of control for real by the looks of it. 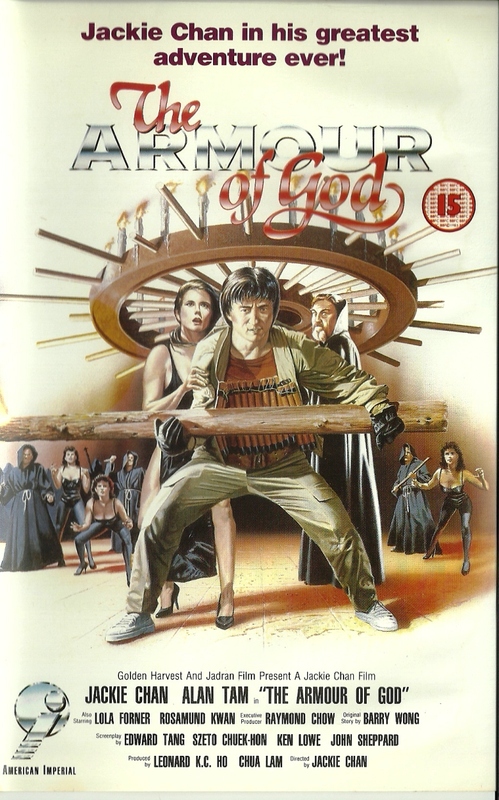 Upon getting Laura and Alan to safety he stays behind to regain the Armour of God and now he must confront the cults prime fighters ,four Amazon Women which will give him hell.It's well known in this fight that Jackie wanted to get away from the multiple attackers attacking one at a time ,here all four fighters attack him head on and Jackie has to fight to survive ,there are some doubling scenes for the women ,you can see members of Jackie's stunt team in drag fighting JACKIE. 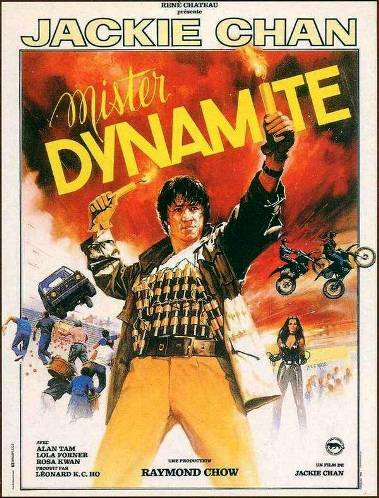 Once defeated Jackie is fronted out by the hordes of cult members.But with one last chance and the fact that Jackie is wired to blow with Dynamite he bluffs his way out of trouble but not before all goes wrong and the place is blowing up around him ,Now he must get out and out he does as he Leaps from the mountain side of the base camp to a Hot air Balloon just below him in the sky.This is Jackie doing what Jackie does best entertain and spell bind with his feats. 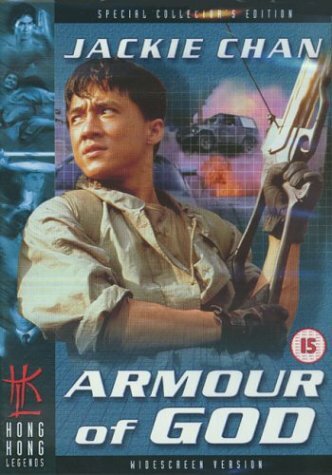 Armour of God is a Hong Kong film that deserves to be seen by everyone.there are many intricate scenes that deserve a second or third viewing to full discover their magic. 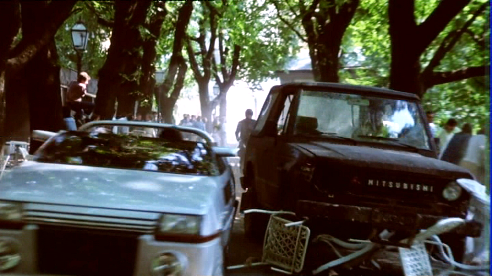 Near Death: During filming, one scene called for him to jump from a wall to a tree branch. The first take went perfectly, but Chan wasn't satisfied and had wanted to do the scene again. On his second jump, the branch broke and he fell 150 feet to the ground below. His head hit a rock, cracking his skull and shooting a piece of bone up into his brain. Chan was flown to the hospital and was in surgery 8 hours later. 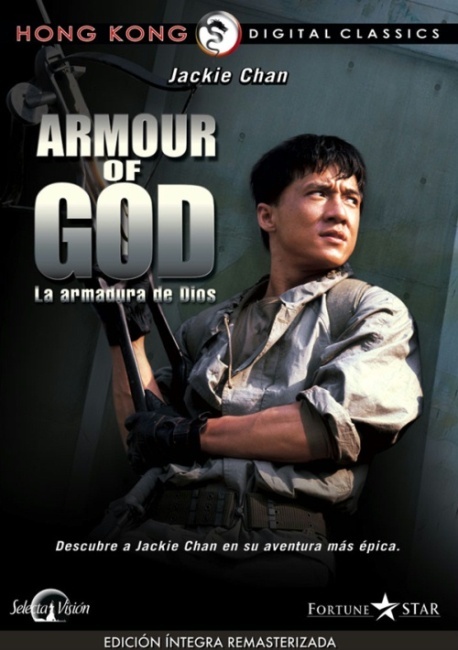 Box office draw: At the Hong Kong box office, Armour of God was Chan's biggest hit up to that point, grossing HK $35,469,408 in its theatrical run. 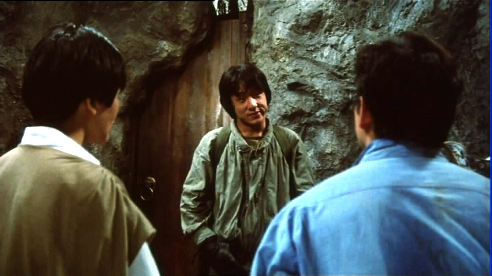 Confused : In one scene Jackie's character infiltrates the cult's hideout and rescues Alan and Laura. Laura accidentally addresses Jackie as "Kong-sang". 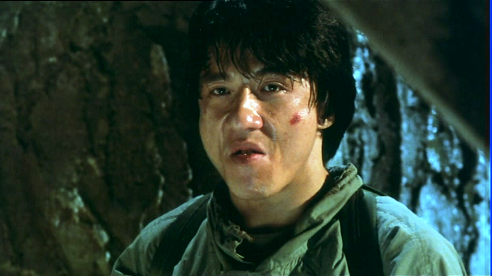 Later, when Jackie tries to leave Alan in the prison by himself, Alan addresses him as "Chan Kong-Sang". 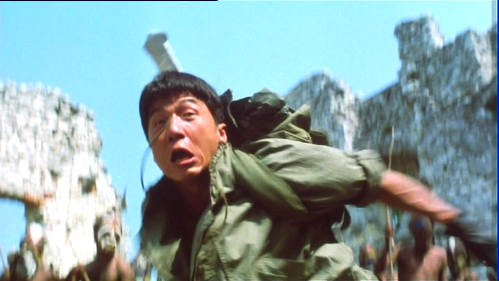 Chan Kong-Sang is actually Jackie Chan's real life birth name. 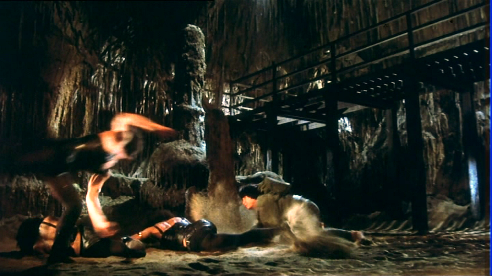 In the dubbed US version of the film, these errors are covered by changing "Kong-sang" to "cowboy". In another dubbed version, the 'Kong-Sang' is left in but explained by Jackie that only she is allowed to call him that, turning the name into a nickname between lovers.